Home » Ms. Foundation: Recovery for Who? The recession has put thousands of Americans in a position of economic insecurity. But where do low-income women and women of color fit into the recovery plans? The Ms. Foundation for Women conducted a survey of low-income women and women of color to see how the recession has affected them. The findings underscore the fact that women are being overlooked in this recession, and may even be faring worse than men. Photo by Elizabeth Rappaport. 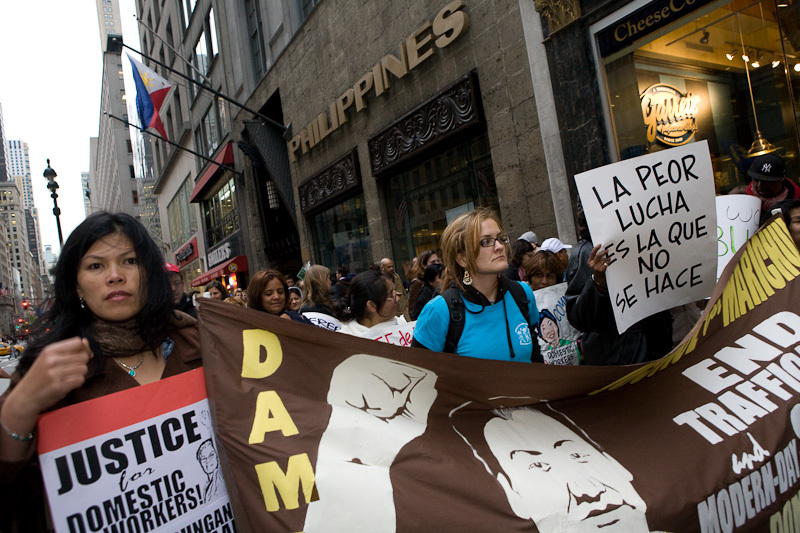 Domestic Workers United March in Manhattan, October 2008. Domestic Workers United fights for fair working conditions and pay for domestic workers in New York state. In September 2010, after years of hard work and advocacy, they won passage of the Domestic Workers Bill of Rights which is the first legislation in the country to provide domestic workers with basic workplace protections, including paid sick and vacation days, overtime pay, and one day of rest per week. Photo by Elizabeth Rappaport. 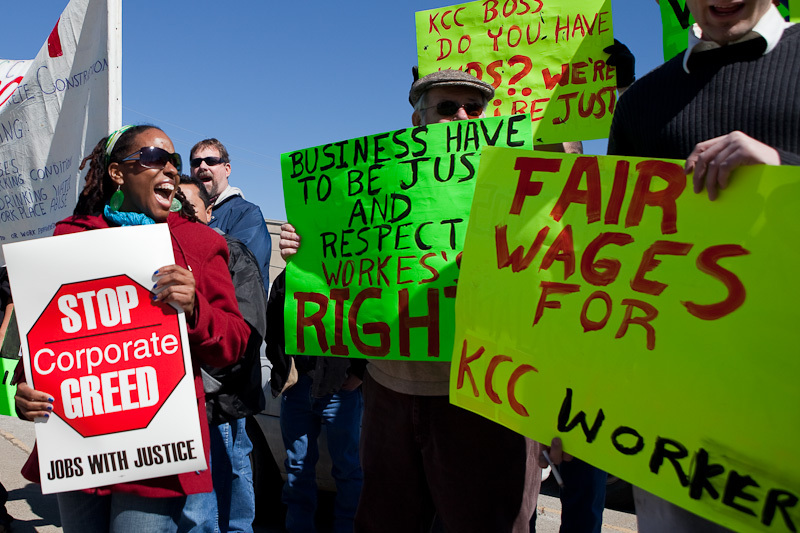 Kentucky Jobs With Justice protest, Louisville, Kentucky, March 2010. Kentucky Jobs With Justice fights for fair wages and working conditions for underrepresented populations, in this case for immigrant workers in the construction industry. Photo by Elizabeth Rappaport. 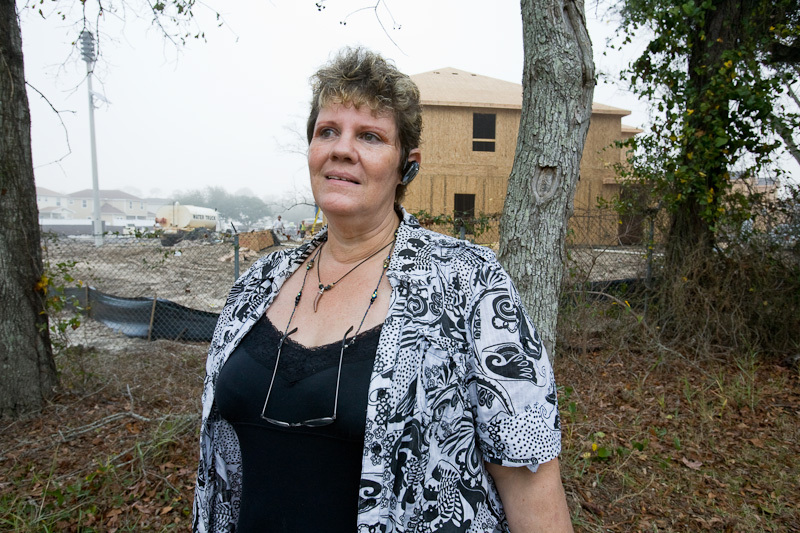 Vicky Cintra, MIRA Organizing Coordinator, in front of construction site at Keesler Air Force Base, Biloxi, Mississippi, December 2008. For several months now we have heard that the Great Recession is either winding down or picking up steam again. For low-income women and women of color, however, economic insecurity has been and continues to be a long-term reality - regardless of what the economic prognosticators tell us. These women were struggling long before the recession began, and continue to struggle today. For example, while most people say they have been concerned about the economy for the past two years, 55 percent of African American women report being worried about it for five years or more, according to a national poll conducted by Lake Research Partners for the Ms. Foundation for Women and the Center for Community Change (CCC). In the same poll, two-thirds of Latinas reported that their personal circumstances have been affected by the country's economic situation and more than half report that they or someone in their household has lost a job in the past year. Large numbers of Americans are struggling, but the circumstances for many women are especially dire. A third of all women, compared with quarter of all Americans, say they live paycheck to paycheck. And a third of all women compared with a quarter of all men say they have less than $500 in savings. For these women and families, the "everyone for themselves" individualism espoused by the Tea Party movement rings hollow. The Ms. Foundation/CCC poll makes it clear that most Americans want more - not less - government help. Overall, 52 percent said they believe the government should play a greater role in creating jobs and training programs, helping to trim health care costs, and combating corporate greed. Those numbers increased to 66 percent for African American women and 68 percent of Latinas. The survey's findings underscore an often overlooked aspect of an economic downturn frequently labeled a "mancession" because of the large number of men who initially lost jobs. Recent evidence, however, shows that women are actually faring worse. According to a report from the Joint Economic Committee, from October 2009 to March 2010 women lost 22,000 jobs while men gained 260,000. More recent analysis by the National Women's Law Center shows that 62 percent of the jobs lost in July were lost by women. Their analysis also shows that unemployment is growing among women who head families, and among African-American women and Latinas. Unfortunately, the difficulties confronting women and their families are too often pushed to the back burner in policy debates. Our government leaders have an opportunity to change that as Congress considers several pieces of legislation that could make an enormous difference for millions of low-income women. These include bills that would create jobs, provide education and training opportunities, ensure equal pay for women, paid family and medical leave, and affordable childcare. Many members of Congress consider it politically risky to support such policies, assuming voters oppose any legislation that would cause an increase in the federal budget deficit - if only temporarily. But the Ms. Foundation/CCC poll found that most people are less concerned about the deficit than they are about rising health care costs, the lack of jobs with family-sustaining wages, and the affordability of every day expenses like food and gas. Despite messages from the far right, most people also consider helping those who are struggling key to strengthening our economy. Three out of four said policies that would create more jobs with decent wages and benefits for low-income families are important to them personally and even more believe such policies would be good for the economy. They also see a need to address structural inequities in the economy that hold back major segments of the population. Three out of four, for instance, consider equal pay and benefits for men and women personally important to them and an important component of a healthy economy. Whether or not our country is still in a recession is an irrelevant concept to millions of women and their families who have struggled for years to make ends meet. Our country and our state will not experience a genuine economic recovery unless helping them becomes a priority. To learn more about the Ms. Foundation for Women, visit www.ms.foundation.org.